Fall is in the air and this is reflected in my latest wish list. When the seasons change, I'm always up for a little home refresh and cozy cashmere sweaters call my name as the the weather starts to chill. Everything from the Peach & Lily skincare collection sounds so good. This serum which contains a revolutionary cocktail of peach extract, niacinamide, East Asian mountain yam, madecassoside, peptides, and hyaluronic acid help to hydrate, calm, brighten and firm skin is first on my list to try. And how exiting that this collection is available at Ulta! This mask is just so pretty. I love a cozy cashmere sweater especially when it comes with a powerful message. This will make a nice replacement for the one in our kitchen that conked out recently. I usually make my own salad dressing in old jars but this cruet is really much more attractive. This scent of this candle which combines top notes of sandalwood and cedarwood; heart notes of vetiver, nutmeg and cinnamon; and base notes of amberwood sounds so so comforting and perfect for fall. And the minimal design is lovely is as well. The tagline for this book is "For food that's as beautiful as any photograph - and tastes every bit as good as it looks." You got me. Form meets function in this elegant piece that holds strike-anywhere matches that can be lit on the surface of base's rough glass etchings. This will make a wonderful gift as well! Christmas is just a 3 months away! Stylish storage solutions are a must in our house and the pom poms on this basket add a fun touch. Love this list Rowena! The sweater is so cute! Thanks for including cookbooks in these types of posts! Have a wonderful week! Happy Harvest Moon Festival as well! I especially want the storage box with the pompoms. and this cute sweater. I always look forward in wearing cozy sweaters, your wish list is on point. These are all beautiful items and would make great gifts for the holidays which are just around the corner. The serum from Peach and Lilly sounds interesting! And how cute is taht sleeping mask?! Really nice wishlist! That serum! I wonder if it will be available internationally, the website says it is currently out of stock: Both the ingredients as well as the packaging are amazing. Lovely items, tha storage basket is super cute! this is such a lovely list. Amazing items my dear. Ooh I'm going to have to check out the serum as well! I wish they had something for smoothing over fine lines though. you're reminding me of Christmas shopping now. Hopefully there are good Black Friday sales where I can get a lot of that done! I didn't even know match strikers were sold! I thought it was one of those plug-in devices that melt scented wax. Lol. It's super cute though! 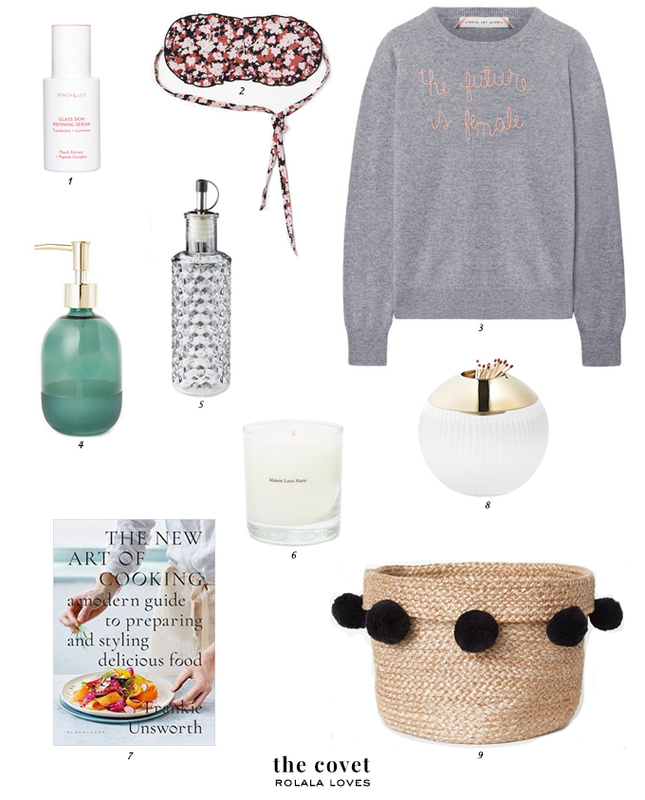 How cute is that storage basket with pompoms..and that sweater looks very comfy. The first thing that caught my eyes was the match striker, it's so cute! That and the candle, which sounds perfect for fall, would make a cute gift together!